This is actually a variation on the Linguine with Goat Cheese recipe. My youngest brother called me up saying he wanted to make the Goat Cheese Linguine, but he and his girlfriend are trying to cut back on calories and of course, my original version is full of cream, cheese, butter, etc.. He and I tossed around a few ideas and substitutions, and below is a lower calorie (still has calories) “lighter” version of a creamy pasta sauce. Plus it uses seafood instead of chicken. However, you can make this with chicken if you wish or just use all vegetables. It is pretty easy to adapt it to what you have in the house. My suggestion for veggies are based on my preference, however, you can use what you like, just follow the same process for blanching them. 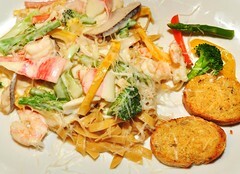 Classically, Primavera is served with Linguine. However, you can use whatever type of pasta you have on hand or enjoy making. Penne, Fettucine, Ziti, Rigatoni, Spaghetti, etc.. all work fine. This is an easy dish, but has multiple steps. Some can be done at the same time and to reduce clean up and enhance flavor, done in two separate pans. This can be done on a week night in about 1 – 1.5 hours. To reduce this time, do the prep work and blanching of the veggies the day or weekend before. They will last in the fridge for a few days. I usually do shopping and prep work on weekends. Blanching vegetables only slightly cooks them making them a great quick ingredient for salads, pastas, etc.. during the week for a quick healthy dinner with minimal work. Just add toward the end of cooking to heat through. No need to worry if they are done or not because they already are. Blanching is a simple process, and each type of vegetable should be done separately as cooking times vary depending on thickness of the vegetable. EX: Broccoli, Cauliflower and Carrots can be done together – but Asparagus should be done separately as it cooks very fast. Blanching/Steaming can easily be done in the microwave as well. Just put the veggies in a bowl, add a little water to the dish and heat on high for about a minute. Check the doneness, and put back in for an extra 30 seconds at a time until done yet still a little crispy. Plunge into ice-cold water to stop the cooking process. Drain on paper towels and set aside. To blanch on the stove, bring a pot of salted water to a boil, plunge in the vegetables, and cook for about 1 -2 minutes until the vegetable is bright in color and slightly soft to your liking. I like my veggies a little crisp, but do what you like. Remove from the water and plunge into ice water to stop the cooking.Drain on paper towels and set aside. 1 4 oz package of goat cheese crumbled to make mixing easier (you can use plain or herbed or other varieties they have in the market that you like) You can cut this in 1/2 if you wish or omit – but then this is no longer creamy.. but that is OK if you do not want it. You can use crumbled Feta or other creamy cheese instead. 1 cup sliced mushrooms (any kind you like)* – DO NOT BLANCH. See step 4. 2 Roma tomatoes, diced* – DO NOT BLANCH the tomatoes. Just add in step 10. Combine all the sauce ingredients in a bowl. Whisk together well until smooth. Set aside to let the flavors release and combine. Put a large stockpot of water on high, add 2 – 3 TBS of salt to the water. Bring to a light boil. When the water boils, in batches blanch the vegetables. Remove them with a slotted spoon to an ice bath, when cool Remove and let dry on paper towels. While you are doing this, continue with the next step. When done with all vegetables SAVE the water for the pasta. Bring it back to a boil. As you are blanching the vegetables, In a large saute pan, heat the butter, 1 TBS of the olive oil until HOT. Add the mushrooms and a little pepper. Saute and cook over med-high heat, stirring occasionally until they begin to brown on both sides. about 5 – 7 minutes. Remove from pan and set aside. Lightly salt and pepper both sides of the shrimp and scallops. Add more oil and butter to the pan and when the oil is HOT, place the scallops in the pan and sear on side one. Squeeze a few drops of lemon on top of each scallop. After about 2 – 3 minutes, flip the scallops to sear the second side for another 2 minutes. Remove to a plate and set aside. Toss shrimp in the pan and squeeze a little more lemon on top of the shrimp. Once the shrimp turns pink on one side, flip over and let turn pink on the second side.. about 3 minutes Total. Remove the shrimp to the same plate as the scallops and set aside. ***You want both the scallops and shrimp to be just under done as they will continue cooking once you remove them from the pan and when you add them back into the pan at the end. Cook the pasta at this point until el dante. Add another TBS of oil to the same pan you cooked the seafood in. Add in the shallots, garlic and hot pepper if using. Saute until garlic and shallots are soft. Pour in the sauce ingredients from step 1 and scrape up all the bits that may be in the pan. This will add extra flavors to the sauce. Let simmer until it begins to thicken. Taste the sauce. Adjust seasoning with salt and pepper. You can add more butter if you feel it is needed. Let simmer until the pasta is done. Once pasta is done, remove pasta from water and put directly into the pan with the sauce. Mix together and then add in all the vegetables and seafood. Taste again and adjust if necessary and let cook another minute or two to make sure everything is hot and combined. Toss in the fresh diced scallions and serve. You can top with parmesan cheese if desired. Just factor that into how much salt you decided to add-on the last tasting. Spinach 2 cups or one small frozen package, extra water squeezed out – you would add this about a minute into sauteing the garlic and shallots in step 7. It can also be added towards the end of step 9 to keep the fresh green color bright. Similarly – you can substitute any of the seafood can be substituted out for other kinds you like, such as mussels, haddock, swordfish, etc..
You can omit the seafood and replace with chicken, pork, ham, sausage or combination of as well. It is all up to what you have and like. Or just use vegetables. to make it vegetarian. The list continues. Just use what you like, just follow the blanching or steaming process for vegetables and if using meat or other seafood cook in the same pan you will make the sauce as that flavor will impart when you add the sauce to the pan. Use the same water to blanch or steam the veggies to cook the pasta, you are adding extra flavor to the pasta. ** You can serve this over rice instead of pasta if you wish. Cook the rice according to package directions, spoon the rice on the plate and top with this wonderful dish. Have fun experimenting with this dish. You can make it often and never end up with the same dinner as there are so many options! Posted by culinaryease on May 19, 2011 in Cooking for two or less, General Cooking, Recipes, Vegan/Vegetarian and tagged Pasta, PostaWeek2011, Primavera, Seafood, Vegetables.